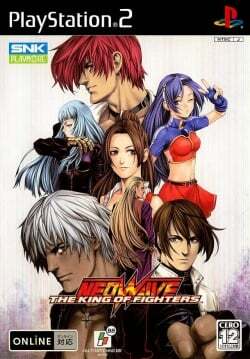 Game description: KOF Neowave features 12 three-man teams made up of some of the greatest characters from SNK's 11-year history, including the Women Fighters Team (Mai, King and Yuri) and the Fatal Fury Team (Terry, Joe, and Andy). NEOWAVE features three modes of play - Super Cancel, Guard Break, and Max2. A new "Heat Mode" lets players power up their attacks in exchange for a gradual loss of health. Xbox Live support featuring head-to-head fighting and Tournament Mode. A total of 43 characters including 7 Bonus characters. 12 of the most dangerous fighting teams ever assembled. Pick your team and fight it out in the original 3-on-3 battle format. Beautifully rendered background graphics. Activate "Heat Mode" to power-up your attacks. Revives the evacuation rolling maneuver and thrust attacks. Over-the-top Super Special Moves. 3 modes of play: Super Cancel, Guard Break and Max2. Link a Special Move with a Super Attack in the Super Cancel Mode to cause extreme damage. This page was last edited on 16 December 2016, at 19:14.